There are four stages in this process. Lilian Silburn, Bettina Bäumer and Jaideva Singh all interpret the word tayā to mean the energy of the subtle breath. Silburn and Bäumer interpret mūrdhāntaṁ to mean the crown of the head and identity this with brahmarandhra. However, Jaideva Singh says the brahmarandhra is a space covered by twelve finger widths from the middle of the eyebrows. There is some uncertainty here. In any case the whole body is filled with subtle breath (prāṇa). The next step is to contract the eyebrows. Silburn, Jaideva Singh and Bäumer all readily acknowledge that this technique is now lost. Nevertheless, the following considerations may be of value. Is the technique related to the bandhas that are made in yoga at the perineum or the stomach or the throat? These contractions are designed to overcome blockages (granthi). Although the practitioner is filled with subtle breath and therefore experiences no blockage within his own being, there is perhaps a further step to be taken. Does this next step represent a release of the energies that are contained within him like the rush of waters held back behind the wall or the bridge (setunā) of a dam. Lilian Silburn and Jaideva Singh both speak of the energy of consciousness (citśakti). The act of contracting the eyebrows occurs when mind and will are focused on something. It is the projection of energy. So, according to the Devīmahātmya, when Durga was involved in battle with the demons, she frowned, and from her frown Kālī leaped forth to destroy them. The eye-brow centre, where the iḍā and piṅgalā come together and join their energies, is also the cakra point of ājñā, which means authority. Bäumer makes the comment (p. 77 fn. 69) that eye-brow centre is where the guru places sandal paste, for example, so as the bring the disciple to a heightened consciousness. The practitioner, having filled himself with prāṇa and not distracted by any limited thought constructs (see below), now contracts his eye-brows. This has the effect of projecting the energy beyond the limits of the body into the highest realm. In this way the practitioner is transported to a consciousness he did not have before. The practitioner is no longer distracted by the multiplicity of thoughts, but is completely focused, spontaneous, free of calculation or doubt, or of any attempt to categorize and understand. There is totality in his action. The practitioner transcends his own body and achieves a consciousness, which is beyond all limitation. The repetitive nature of the phrase ‘he transcends all (sarvagodgamaḥ), above all heights (sarvordhve)’ emphasizes the surpassing nature of this consciousness. 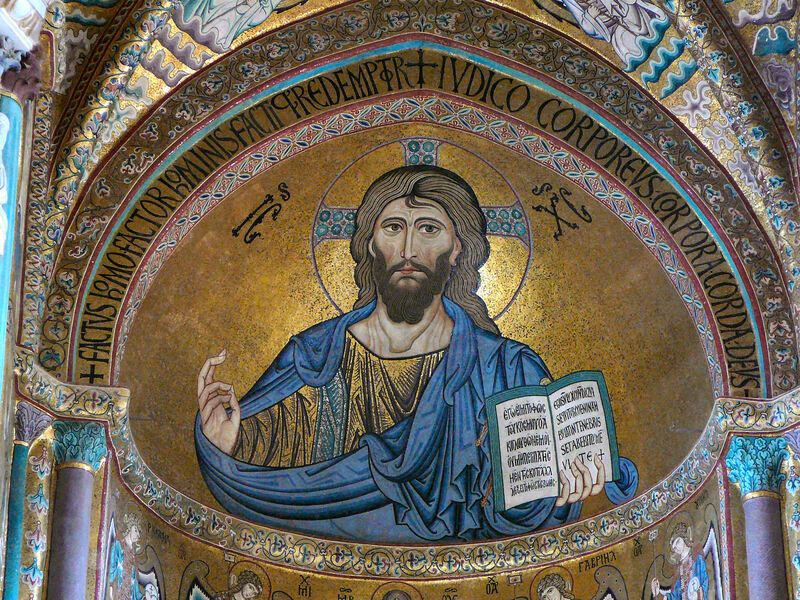 It is interesting to note that the lines of concentration are apparent in the mosaics of Christ Pantocrator, a term which means ‘the one by whom and for whom all things are made’. He has all authority. As in the following example from Cefalu in Sicily. In the ceremony of confirmation, the bishop extends his hands over the confirmands and prays that they will receive the “the spirit of wisdom and understanding, the spirit of counsel and might, the spirit of knowledge and the fear of the Lord” (Isaiah 11:2), which describe the energetic, ideal king who will bring justice to his people. He then places the oil of chrism, which represents the Holy Spirit, on the forehead of the confirmands and seals their baptism in water by means of that Spirit. The confirmands are therefore empowered to restore what is right and to defeat what is wrong. They are ‘soldiers of Christ’ (miles Christi Jesu). The bishop unleashes power of the Spirit in them. The bishop next strikes the confirmands on the cheek in an ancient gesture taken from Germanic custom, which signifies the transition from slavery to freedom. The confirmed persons are now free with the Spirit of freedom. Lastly, the bishop greets the confirmed person with the words ‘peace be with you’, as a sign of equality. Although the bishop has his own special ministry in the Church, the confirmed and the bishop are equal members. The confirmed person is free, equal, and empowered. All this occurs on the forehead, between the eyebrows. This entry was posted in Christian tantra, Kashmir Shaivism, Vijñānabhairava-tantra. Bookmark the permalink.